Baby D is 3 months old. In addition to cooing, he is also starting to babble. Cooing is the vowel sounds: oooooooh, aaaaaaaah, while babbling is the introduction of some consonant sounds. Lately we are hearing a lot more gaaaaaa, goooooooo, and maaaaaaaaa. 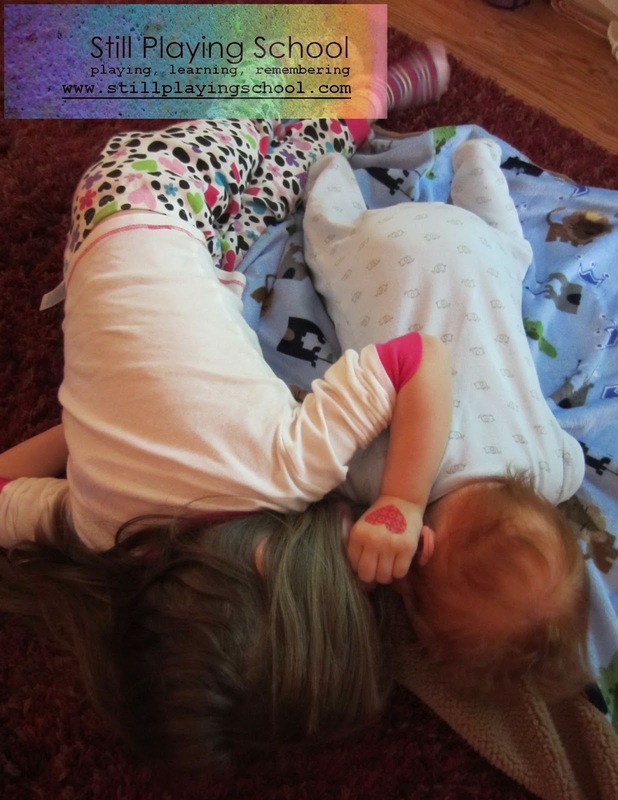 E is an amazing big sister (again!) so we've been coaching her on how to help D learn to talk with the following tips, which are helpful for siblings and adults alike. Of course, we don't give E all the child development reasoning, but we do tell her she's an awesome big sister! - E will tell me that D is crying when he makes any sounds. I had to explain to her that sometimes what sounds like fussing is actually him just practicing his "words". - When D makes some of his pre-linguistic sounds, we repeat the same sounds back to him. We can also teach real words by saying some that start with the same sound. E: "Maaaaaaa! Yes, Momma! Mommy is in the kitchen." We know that he isn't asking for me yet, but I can step in then and wave to him. This allows him to begin to recognize that the sounds he is making can be put together to mean something. It's also great initial sound practice for E. "D said gaaaaaaa. What can we show him that starts with a /g/ sound?" - After D makes a sound, we answer, then we wait for him to respond. This verbal back and forth sets the stage for the turn taking of conversations. He is learning expressive and receptive language. 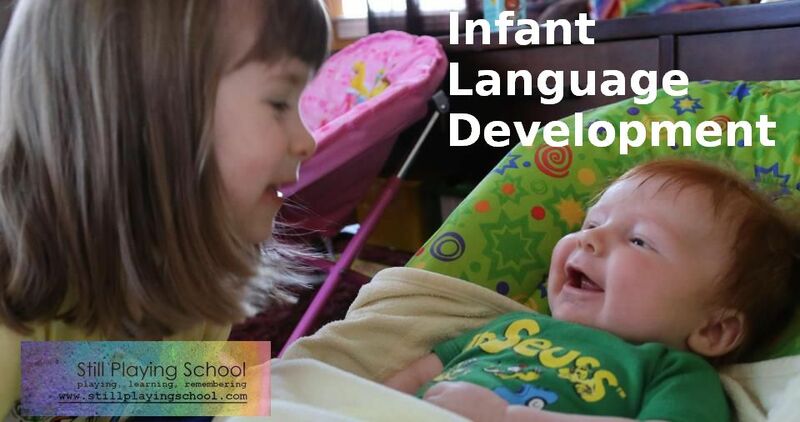 One study shows that 4 month old infants who have pre-linguistic turn taking with an adult have greater cognitive ability when they are 2 years old. - E shows D objects around the house while telling him their names. Adults can do this by carrying the baby to different rooms to take in new sights, but E needs to stick to bringing things to him. "Look, baby D, this is Cowie! Cowie is a cow. Mooooooo!" - Today she also showed him her sippy cup and signed "milk" to him! I was so excited that she remembered the sign, but then she did the same sign for grape juice and duck, so obviously we need a refresher course on baby sign language. Not only do these exercises allow my kids to interact while I may be occupied with other things, but we are also teaching D to use other sounds (instead of crying) to get our attention. Here are some great sample infant sound recordings! Before I know it, they really will be whispering secrets to each other!